Affirming yesterdays pledge that VW would make a major move into electrified vehicles, the company is showing two all electric cars, the e-up and e-Golf, in Frankfurt. Following up their pledge of electrified car leadership by 2018, Volkswagen unveiled a pair of electric cars today at the International Motor Show (IAA) in Frankfurt am Main. The e-up! and e-Golf are Volkswagen's two new highly efficient all electric cars, which VW says are perfect for everyday use, four-door models in all cases and fully equipped with standard features like automatic climate control, remote controlled parking heating/ventilation (air conditioning and heating), radio-navigation system, heated windscreen, alloy wheels, LED daytime running lights and in the case of the e-Golf all-LED headlights. As electric cars they have excellent specifications. The e-up consumes just 11.7 kilowatt-hours of power per 100 kilometers of driving, making it the efficiency world champion. The 62 kilowatt electric motor produces 200 Nm of torque onto the front axle, giving a 0-30 miles/hr time of 4.9 seconds and 0-60 miles/hr time of 12.4 seconds. The relatively small 18.7 kilowatt-hour battery pack gives a 160 kilometer driving range (99 miles). 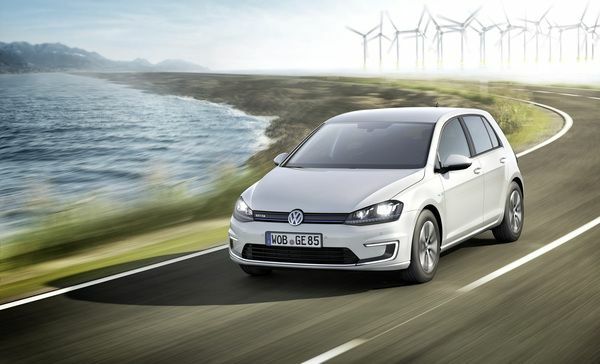 The e-Golf is two classes larger than the e-up, allowing VW engineers to give it better performance figures. Energy consumption is 12.7 kilowatt-hours per 100 kilometers of driving. The more powerful 85 kilowatt electric motor produces 270 Nm of torque onto the front axle, giving it a speedier 0-60 miles/hr time of 10.4 seconds. Top speed is electronically limited to 140 kilometers/hr. The larger 24.2 kilowatt-hour battery pack gives a 190 kilometer driving range (118 miles). The range figures are based on the European Union test procedure, and when these models come to the U.S. the EPA range estimate will be different. Both models have three driving modes (Normal, Eco and Eco+) as well as four settings on the regenerative braking system to help drivers to get the maximum range out of each charge. The e-up will be launched in Germany this autumn. No pricing was given. As we noted yesterday, VW has pledged to take a significant plunge into electrified vehicles over the next few years. Another electrified vehicle coming soon from VW is the Golf plug-in hybrid, which, in contrast to the standard hybrid, can also cover longer distances (50 km) solely on electric power.